Asian Heritage Foundation (Southern Alberta) is the largest Pan-Asian organization in Alberta comprised of between 30 to 40 Asian communities. Our vision is to create a society that is increasingly inclusive and reflective of all cultures, and where Asian Canadians actively demonstrate pride in their contribution to Canadian society. 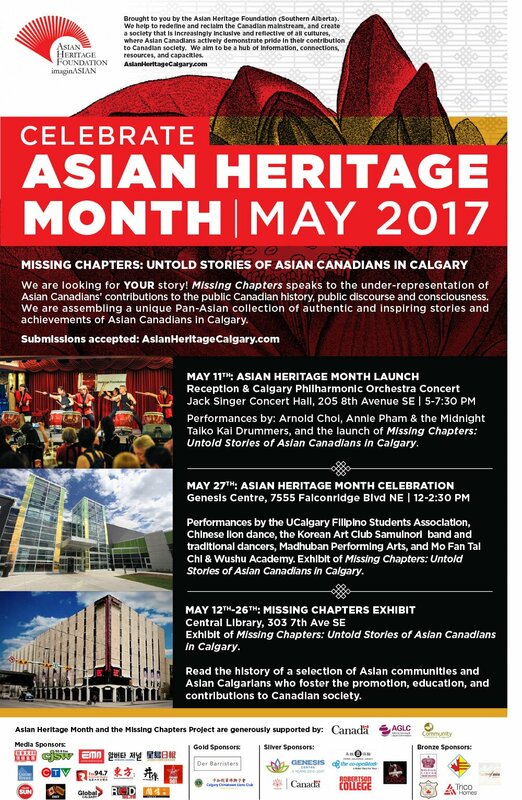 This year we launched “Missing Chapters: Untold Stories of Asian Canadians in Calgary”. This unique project stems from a thorough community consultation held in between 30 to 40 Asian communities in Calgary. Together, community members shared with us their desire to celebrate and share Canada’s 150th birthday in a meaningful way. Only 1 in 5 schools have a plan or strategy to address cultural diversity and competence. A 1% increase in ethnocultural diversity is associated with an average of 2.4% increase in revenue, and 0.5% increase in workplace productivity. In 2010, of the 245 positions within a selection of Calgary’s most influential boards, councils, elected bodies, and media, 31 per cent were held by women, 9.8 per cent by visible minorities, and 0 per cent by Aboriginal people. These groups make up 50, 23 and 2.5 per cent, respectively, of Calgary’s population. If these 245 positions were representative of the population we would find 122 women, 56 visible minorities and 6 aboriginals in this group. The Missing Chapters project hopes to demonstrate the notion that ‘we’ve been here’ and for a very long time. It speaks to the under-representation of Asian Canadians’ contributions to the public Canadian history, public discourse and consciousness. We want stories of individuals from different generations to become a part of the mainstream throughout Canada, a reminder of Asian Canadians past and present. So as part of the Missing Chapters Project we will assemble a unique Pan-Asian collection of authentic and inspiring stories of participation and contribution, struggles, perseverance and resistance, identity and belonging, settlement and integration, social inclusion, community development and collaboration, as well as showcase the achievements of Asian Canadians in Calgary. We are looking for YOUR story! Missing Chapters can only succeed with the deep connections, influence and outreach capacity of our community partners and members. With the support of our funders and sponsors, the AHF is committed to assemble a strong team to support the work. The project will be shared widely through social and printed media, to be displayed at various locations throughout the year, which began with Asian Heritage Month in May 2017. Asian-Canadian history stories: include some historical photographs and stories, ideally from a personal perspective – family photos and stories, such as pictures from past Chinatown, early Japanese families, refugee stories, etc. History stories from our living elders – focusing on older people in the communities and their stories. Asian-Calgarian artists and their contributions to arts and culture in Canada. Immigration stories – focusing on the richness and diversity of Canada’s immigrant population and celebrating Canada’s immigration policies. Stories of community development and building efforts. Inspirational community members and work they are doing in our city and country. Youth stories of identity, connection, integration and citizenship. ** Interpretation and translation services are available upon request to ensure a wide collection of stories from all Asian heritage communities. Who will Review the Story Submissions? To provide a fair, transparent and timely evaluation of submissions of stories. To increase the visibility of the Missing Chapters project and story selection process. To connect the Asian Heritage Foundation and the Missing Chapters project to Calgary’s broader institutions to increase awareness, engagement and support. submit your stories as soon as possible. We are looking for stories throughout the year until the 30th October 2017. The selected stories will be reviewed continuously and showcased throughout the year until December 2017. We look forward to hearing from the community! For the « achievement category » please provide additional information about any awards and recognitions you or your group have received to date. Please submit to info@asianheritagecalgary.org through www.wetransfer.com. Be attached as .png format. Be in RGB colour space. Original size of artwork should be 24x36. A brief description to go with the artwork (200 words). In your submission please indicate if you would be interested in sharing your original artwork at our future exhibition. Your manuscript should be a maximum of 5 pages. No word limit as long as it fits 5 pages. If submission is over 2 MB please submit to info@asianheritagecalgary.org through www.wetransfer.com. For the Achievement Category: List all the rewards and recognition you have received. By submitting my story I hereby give permission to the Asian Heritage Foundation for my story to be published or showcased to the public via social and printed media.